The hotel offers a coffee shop/café. A bar/lounge is on site where guests can unwind with a drink. Wired and wireless Internet access is available for a surcharge. This Mykonos hotel also offers an outdoor pool, multilingual staff, and a garden. Concierge services and limo/town car service can be provided. Parking is available onsite for a surcharge. Artemis has designated areas for smoking. 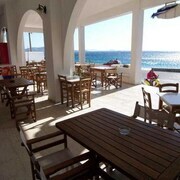 Situated in Mykonos, this hotel is within 1 mi (2 km) of Tourlos Beach, Mykonos New Port, and Agios Stefanos Beach. Mykonos Old Port and Windmills of Mykonos are also within 3 mi (5 km). This hotel features an outdoor pool, a bar/lounge, and a coffee shop/café. Other amenities include WiFi in public areas, self parking, and concierge services. All 23 rooms provide balconies, refrigerators, and TVs. Hair dryers, safes, and showers are among the other amenities that guests will find. Artemis offers 23 accommodations with safes. Rooms open to balconies. Bathrooms include showers and hair dryers.